I share this page with you simply because I am a fan who loves to capture and share quality images. This page is not officially endorsed by Foreigner as a band, any individual band member(s), or any other person professionally associated with their organization. These images are not for sale. Mr. Tom Gimbel on the saxophoooooooooooooone!!!! No, I'm not exaggerating—that's exactly how Kelly Hansen yells out Tom's name immediately after playing the sax solo in the middle of the Foreigner classic, Urgent. This Gimbel fella—he plays: guitar, drums, sax, flute, keyboards...get the idea? 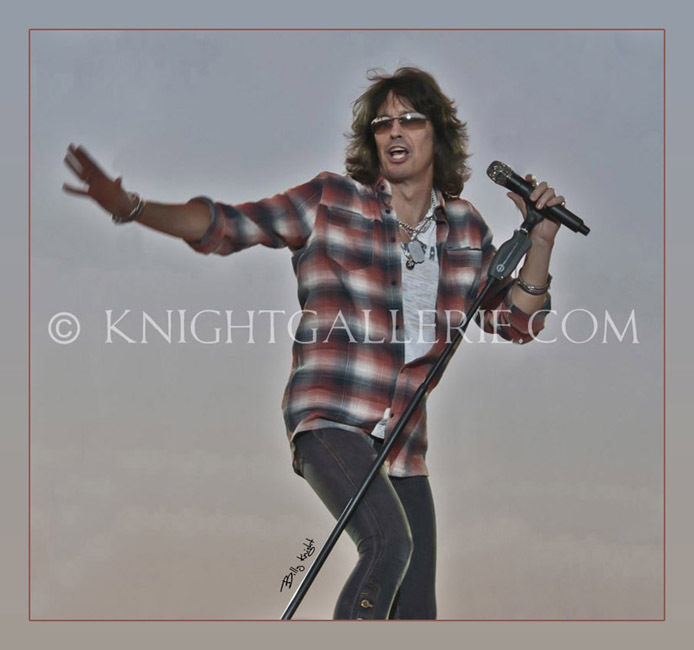 He joined Foreigner permenantly in 1995 after touring with Aerosmith for five years. I captured this image of Tom on July 20th, 2012, in Waukesha, Wisconsin. I have literally taken hundreds of thousands of photographs during my life, and this is truly one of my all-time favorites. It hangs proudly in my office here at The Knight Gallerie. If you don't know who this man is, his name is Bruce Watson. He's likely one of the most overlooked performers in all of rock and roll. He plays guitar for Foreigner and is a perfect fit! He sports a perpetual smile and has an onstage personality that leaves you feeling happy. He's not arrogant or showy; in fact, if he was ice cream, he would be "Rich Vanilla" A good 'ole stand by—loved by everybody! In addition, he is extremely photogenic as you can see. Wonderful performer; Bruce Watson—don't forget that name! He's a Knight Gallerie favorite! Mr Bruce Watson on guitar and perpetual smile! No matter how deeply I delved into my Knight Gallerie archives, I couldn't find one single image of this man without a smile on his face. This man sincerely inspires me to be happy with my own life by the way he conducts himself onstage, and from what I hear, with his fans. This is another of a handful of my all-time favorite images. It looks like it was crafted in a studio, but it wasn't. I captured this image while Bruce was playing the opening riff of the Foreigner classic Hot Blooded. This portrait also hangs on my wall here at The Knight Gallerie.